For the third consecutive summer, my mind has been on the subject of stone – dry stone. Early this spring I was invited to participate in another Stone Festival; this time being hosted by the Saugeen First Nation #29 located near Southampton, Ontario. For the past two years, the SFN has had a crew of apprentice dry stone wallers working under the guidance of master waller Dean McLellan, working to rebuild a massive stone amphitheatre that had fallen into disrepair. The amphitheatre originally took ten years to build, and contains a whopping 900,000 tons of stone! This stone festival was to help draw attention to their project, and the amazing work being done by this small crew of First Nations craftsmen. Part of the festival involved the (partial) building of a large stone roundhouse. As with Willowbanks forge studio, the roundhouse wasn’t completed during this single weekend – I believe they intend on finishing it at a subsequent event (next summer, perhaps?). It is my understanding that the roundhouse is based on archeological evidence of similar iron age examples. A very, very cool project that I’m looking forward to seeing completed. Just like the previous stone festivals I’ve attended at Willowbank, the same cast of characters were in attendance – which happens to be some of the most talented wallers there are from Canada, the USA and from as far afield as the UK! 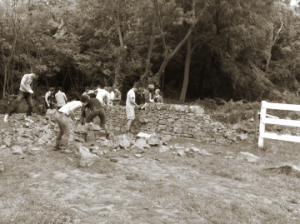 In addition to the building of the roundhouse, there were workshops being held to teach dry stone walling to both members of the Saugeen community, and the general public. There was also an introductory stone carving course being taught by world-class stone carver Nicholas Fairplay. 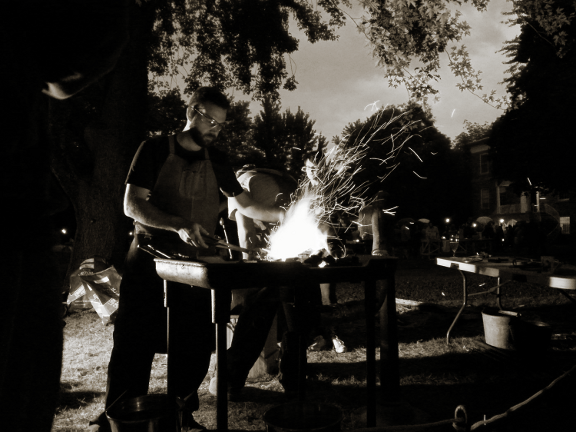 And of course there was also me, blacksmithing …. a bit anticlimactic I know. I find it wonderful that I keep being invited to these stone-related events. The working relationship between blacksmiths and stone masons is one of the oldest amongst all of the various trades. In medieval times, if the blacksmith was absent from the worksite of even the biggest stone projects, all work wold stop after 2-3 days as the masons’ tools became dull and unusable. Of course, in the modern age with advanced tool steels and carbide, they don’t really need us as much. But it’s nice to rekindle that ages old relationship, and to sit and admire each others work. Outside of my days spent demonstrating at the event, most of the rest of my time was spent talking to the masons and wallers about tools; as I’ve been doing for 3 years now. And one thing has become painfully obvious – nobody is making the tools they actually want. Some of these folks have told me that many times over the years, they have contacted their various tool suppliers, making suggestions and asking for changes to the existing product line. Nobody seems interested in listening…. Well, I’m listening. I think the time has come to give this a proper go. Anyways, more on that soon enough. I want to say a huge “Thank You” to the Saugeen First Nation for inviting me to your (first annual?) Stone Festival. I hope to be back to see that building finished! This years event was a little bit different, and slightly more low-key than the first one. The Canadian Stone Carving Festival, which held its annual event together with Willowbank last year, returned closer to home this time. Their event was held in Ottawa several weeks ago. Which is very understandable, as many of the carvers are people involved on the restoration of the Parliament Buildings. In any case, without the stone carvers, the Willowbank Stone Festival was primarily focused on the art of dry stone walling. A sizeable group of wallers from Canada, the USA and Great Britain were in Queenston working to complete the ‘Forge Studio’. There was also a 2-day dry stone walling course on the weekend, followed by a DSWA certification day on Monday. There was some stone carving happening, with several individuals taking a 1-day introductory stone carving course. On Sunday, a group of master wallers participated in a friendly walling competition. It’s absolutely amazing to see these highly experienced craftsmen at work. I’ve no idea how they can do such quality work so quickly. For my part, I had the privilege of teaching an introductory blacksmithing course to a group of dry stone wallers. The students all happen to be from the Saugeen First Nation, and who have been working on the restoration of a large stone amphitheatre. Just like last year, I was blacksmithing in the rain. Note to Willowbank: I’d like some dry weather for next year, please. The students were all very keen, and did quite well on their first attempts at blacksmithing (all things considered). A 1-day introductory course is far too short… at least for first-timers. Just as soon as you’re starting to get the hang of working with tongs, your day is over. Perhaps next year they’ll come back for more. The absolute best part of the weekend, was that the stonework on Willowbank’s new Forge Studio is now complete! Now its just a matter of getting the roof done, sealing up the gable ends, and building all of the windows and doors. Hmm, okay so perhaps it’s not *that* close to being done. But I have faith that it’ll at least be done enough to keep the rain off me by next Stone Fest. This past weekend was the inaugural Stone Festival for Willowbank – an amazing weekend long event, the likes of which I’ve never seen before. Apparently, there is a bit of a tradition among stone carvers of having events like this. The idea is for these carvers to get together as a community, enjoy interacting with each other (with perhaps even a bit of friendly competition), while promoting their craft to the wider public. They each start off with a block of stone, have a limited time to carve whatever they like, and at the end their pieces of work are auctioned off with the proceeds going to charity. The stone carving portion of the festival was organized by Danny Barber, a banker mason whose company Smith & Barber does a lot of work in Ottawa; and who is also our masonry instructor at Willowbank. He had organized this type of festival before, but this year decided to partner with Willowbank to do something a little bit different. And of course, Willowbank being the type of place it is, couldn’t just do what had been done before. We had to up the game, and what we did ended up being very special indeed. For the past couple of years, Willowbank students have been working on the construction of a substantial timber frame building. It was originally going to be a ‘chipping shed’ for our masonry classes. I believe the idea was just an open frame with a roof to keep the elements off us. But someone seems to have come up with a much better plan for that structure – a Blacksmith’s Shop (which they’re calling the ‘Forge Studio’). And even better than the re-allocation of space for smithing, is the decision to add walls. Stone walls. Dry stone walls, to be precise. Yes, Willowbank is getting a heavy (mostly oak) timber framed blacksmiths shop, which will be one of only a handful of dry stone buildings in North America. 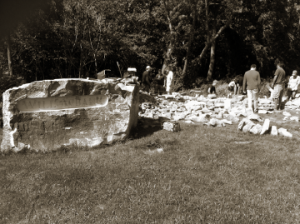 And the dry stone portion of that building, was substantially built this past weekend during the stone festival. I’m nowhere near good enough at writing, to effectively express how totally awesome this building is, or how excited I am about this shop being built. The Stone Festival had (I believe) 24 or 25 carvers working all day Saturday and Sunday, carving some really amazing things. Meanwhile, Willowbank’s dry stone walling instructor Dean McLellan, along with a few Master wallers from Great Britain (from the DSWA), taught dry stone walling courses while a team of 15 wallers worked on the new building. While all of these highly skilled masons plied their crafts, there were other festival-like events filling out the schedule for the weekend. We had a ‘Flea’ going on Saturday, where several vendors were selling cool ‘stuff’ (antiques and such), a bunch of kids were being kept occupied with face painting and other activities, while some tasty food and beverage was being sold – and yes, some of that beverage was of the alcoholic variety ;-) . On the Saturday evening, sleepy, quiet little Queenston came alive with a street dance of all things. Probably the most activity it’s seen since the war of 1812. Okay, that’s an exaggeration – but not much of one. Sunday evening was the ‘Stone Festival Party’, where all of the carvers work was auctioned off. This is where I came in. You see, this event had an ‘elemental’ theme to it. They wanted to showcase stone, glass, wood, iron and the like. And so when this was being planned out, I was asked if I would be willing to do a blacksmithing demo as part of the evenings entertainment. I was happy to do so, but wasn’t going to set up all that equipment for just a few hours. Instead I set up early Saturday morning, and forged all weekend (along with one of our new 1st year students, Tyson, who is also an avid blacksmith). Saturday was the longest single stretch I’d ever forged for. I was set-up around 7:00 am and went straight through to almost 8:00 pm. There was such a large crowd around me the entire time that I never found time for a break. At one point Tyson went on an epic quest to find us some food. Sunday was a slightly later start, but was also really busy. The real excitement was Sunday evening during the party. During most of the weekend, I was busy at my forge, the carvers were busy at their benches, and the wallers were busily working at lifting and stacking very heavy things to make us a smithy! There was this great sound as we were all hammering and chiseling away at our various projects. But as the carvers finished, and the wallers ran out of daylight, I finally got to meet all of these fantastic people as they started wandering towards the forge. What I didn’t realize before, is that most of us who enjoy smacking at things with a hammer, have a lot in common. And the mason’s all seemed to love the blacksmithing. At one point I probably had 20 or more of them crowded around. Many of whom said they ‘always wanted to try this’ (smithing), and so of course I had to oblige them. 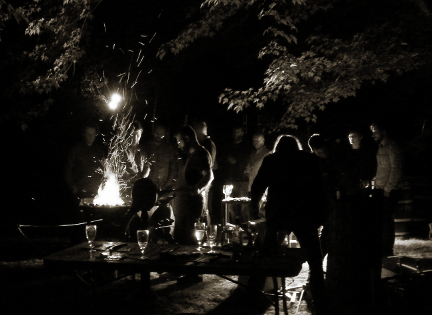 By 9:30 Sunday night, I was standing around in the pitch black, under a tree (in the pouring rain) talking a bunch of masons through making their first basic smithing projects. Despite the late hour, and less than ideal weather, I was having the most fun I’ve ever had working at a forge. I’m going to need a few days to recover, as I’m exhausted, but would do this all over again in a heartbeat. I’m really hoping that this first Willowbank Stone Festival, is the first of many! So apparently, building a dry stone wall involves moving a substantial mountain of heavy rocks by hand. Who knew? 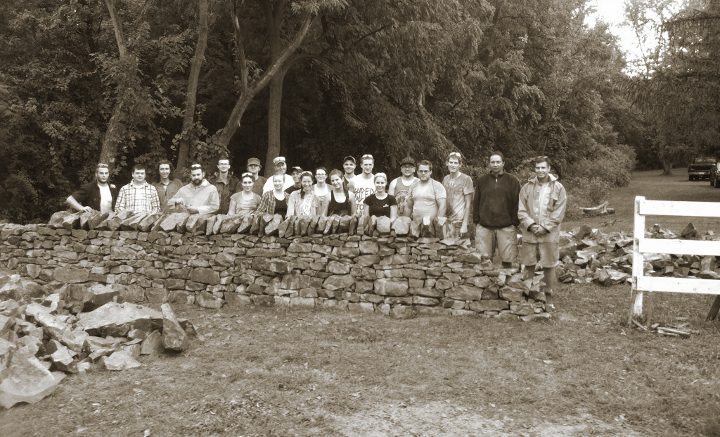 My class mates and I just spent two days having a crash-course in building a dry stone wall; with instructors Dean McLellan and Evan Oxland. I’m tired, my hands are wrecked, and it’ll take a week to clean the mud off of my boots (we got rained-on the second day). But despite all that, I’m thrilled. I learned a tremendous amount in a very short span of time. Doing physical work with a new group of people is also a great way to start building friendships too. Hey, it works for the military – where you get very close to people, very quickly. But the most important part, is that I’ve now helped to construct something that should still be standing generations from now. And that’s awesome!